Wild Woman Native Mask by Stan C. Hunt(Dzunukwa) Native Mask by Stan C. Hunt carved from red cedar. Stan C Hunt comes from a Kwagiulth family from Fort Rupert, British Columbia on Vancouver Island. His grandfather, Mungo Martin is widely credited with saving Kwagiulth art from extinction in the early part of the century. 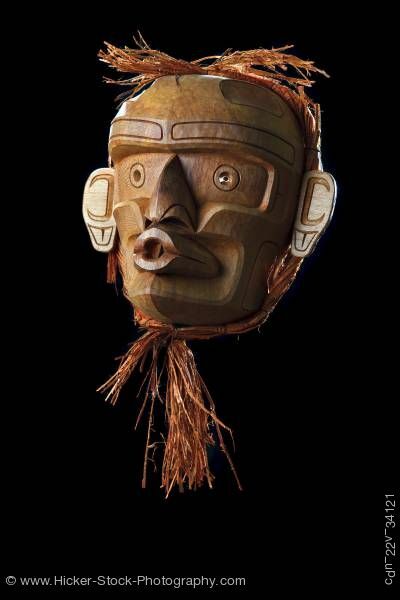 His father, Henry Hunt, was a renowned master carver who worked at the Royal British Columbia Provincial Museum in Victoria for many years. His older brothers, Tony and Richard Hunt, are among the leading artists in the Kwagiulth form. Stan's interpretation of the Kwagiulth style is starkly traditional. No power tools or sandpaper are used. Only the traditional tools, the adze, curved knife,Dz and straight knife are used. The images are original but with traditional roots in stories of the Kwagiulth people; images passed down from one generation to the next.